Tables, Bar Tables, Chairs, Bar Stools, Cocktail Tables, and more! Cocktail Tables- 30″ in diameter and can be set at standing height of 42″ tall or a dining height of 30″ tall. Add a table linen for an elegant look. 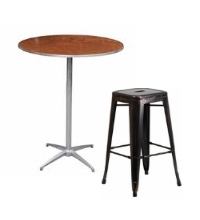 Pair our Cocktail Tables with our 30" Bar Stools for extra comfort. Bar Tables- Our bar tables come in two styles. One is a wooden folding bar and the other is a commercial grade Cambro Bar (bars do not come stocked). Rectangular Tables- We offer 4' long tables and 6' long tables. As well we do offer childrens tables so everyone can join in on the fun. Table Linen, Table Skirts, Table Runners- Our table linen is either BLACK or WHITE. The pricing of our table linen or table skirt depends if it is fitted for a rectangular or a round table. Tables runners come in the following colors: Blue, Pink, White and Black. Chairs, High Chairs, Stools, and Boosters- Our chairs come in black or white, and are your standard plastic event chairs.